Leading Manufacturer of high performance rotary lobe pumps, industrial lobe pump, rotary pump, rotary gear pumps, lube oil pump and crude oil dispatch pump from Chennai. 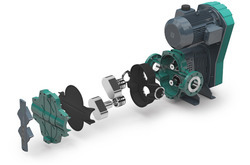 NETZSCH TORNADO® Industrial Lobe Pump are versatile stand-alone equipment. Used primarily in environmental technology and the chemical industry, these pumps handle almost any substance continuously and gently while metering in proportion to rotation speed. Their small space requirements and high power density are some of their most important advantages. NETZSCH TORNADO® Industrial Rotary Lobe Pump are versatile stand-alone equipment used primarily in the Environmental, Chemical, Food and Pharmaceutical industry. These pumps handle almost any kind of substance continuously and gently, while metering in proportion to rotation speed. 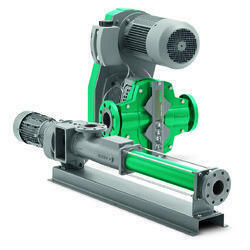 NETZSCH Pumps and Systems are the Leading manufacturer of Rotary Pumps. The Positive Displacement Pump principle is ideal for handling slurries, viscous, shear sensitive or two/tri phase mixtures or when applications require, significant suction lift capabilities. We are the Leading manufactures of Lube Oil Pump. NEMO® Progressing Cavity Pumps can be used in any area of industry where a great variety of different substances must be pumped or very precisely dosed. From low viscosity media to products barely capable of flowing, with or without solid content, shear-sensitive, sticky or abrasive – with the NEMO® BY, even difficult substances are conveyed gently and under low pulsation. We manufacture and supply Crude Oil Dispatch Pump, which are extensively used in air conditioning plants, power station, mine drainage, sprinkler systems fire fighting etc. These pumps are specially designed to perform heavy duty functions and work under high suction pressure conditions. Made from premium quality materials, these pumps are high in performance and have long lasting life.